Learn how to set your company logo and color scheme. If you're on our Growth plan or higher, you can use your own custom branding to further enhance the Attendee experience. This includes adding a custom logo to the different pages that Attendees interact with: Registration/Thank You/Replay pages as well as the Event Room itself. Once in those settings, you'll see a Branding tab that you can navigate to. Select the Upload Logo box (or the current logo, if you've already uploaded one) that appears and you'll be prompted to choose an image file. Following that, you'll be able to resize the logo and lock those changes in. You'll have two options to adjust the color scheme. 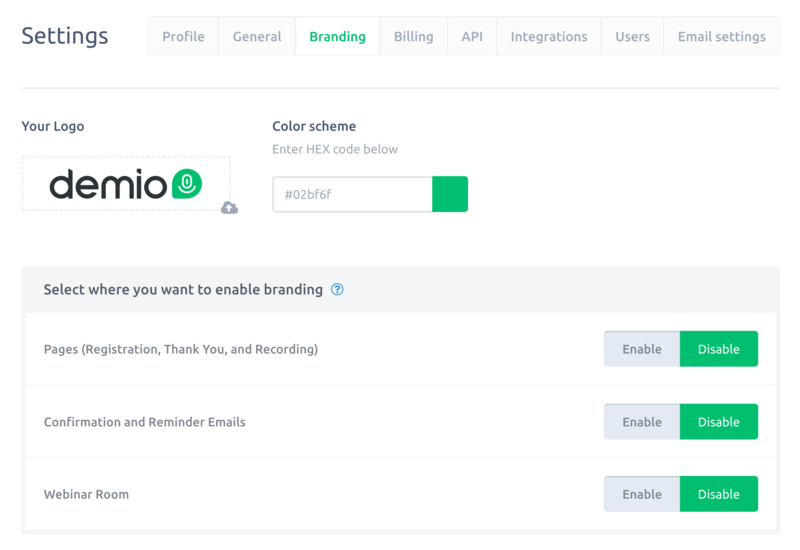 You can add in your desired HEX color code to select those directly. Alternatively, you can select the color square and a color palette will appear for you to choose from. Once you've chosen your color and entered your HEX code, all you need to do is choose where you'd like to include your custom branding.